7.) Purchase a good thermos or insulated carafe to transfer your remaining coffee to (Nissan Thermos is a good brand, check out reviews on Amazon.com). 8.) Coffeegeek.com and Coffeekid.com have additional information on vacuum brewing. Cons: Capacity is only 8 cups (32 oz.). Filter can sometimes be unreliable. Uses more grinds than average peculator or drip models. Extra caution needed when using, as most of the coffeemaker is made of glass. Instructions are scant. Five stars for a wonderful product. I purchased my unit about a year ago from Amazon.com and after about a month of frustration with the filter constantly clogging, I put it out of sight (out of sight = out of mind). When I could get it to work properly, it was great because the coffee tasted the way it smelled – wonderful. But, it was simply not worth the time and effort to get one pot out of 15 to brew properly. I tried burr grinders and the inexpensive type grinders. I tried coarse grind, medium grind, fine grind and everything in between with no success. About two-months ago I remembered I had the Bodum Coffeemaker and so I decided to revisit the task of trying to make a ‘perfect cup of coffee – and it worked perfectly! I use the Bodum Coffeemaker almost every day now and it works as advertised 100% of the time. I have developed a system that works for me by taking suggestions from several of the reviews from Amazon.com and from some helpful advice from a Barnies’ sales representative about how to store and use coffee beans. The one thing that I was probably doing wrong the first time was that I listened to a friend who thought he knew about how to store coffee beans. If you want to go from coffee beans to coffee dust, freeze the beans or keep them in the refrigerator – I guarantee you that this will work. It does not matter what your grind setting is on your burr grinder because you will get so much dust that the Bodum filter will clog and coffee cannot get sucked back into the lower chamber. I now keep my coffee beans in an airtight container in the pantry, grind them as needed and then follow these additional procedures to get great tasting coffee – every time. Make sure the seal is clean and dry and the top is pressed firmly down onto the lower unit. I use a gas burner at a medium-high setting and do not use a diffuser. I think that the diffuser may be recommended to help keep the handle cooler in case you do not center the pot over the flame. Also, be sure you put the lid on top of the upper unit. And, do use caution, because the handle does get very warm. I keep the burner on the same heat setting for 30 seconds after all of the water (except what is below the tube) goes into the upper chamber. There is still a little water left below the tube in the bottom chamber that will continue to boil. Turn the burner off after about 30 seconds, remove the upper chamber lid, and you can do one of two things at this point. If you do not want to move the coffeemaker while the top is full, just leave it on the burner and in a couple of minutes, the burner grate will cool enough to create the vacumm in the lower unit. If you want to cut a minute or two off of the procedure, use a oven mitt to hold the handle with one hand while you use the other hand to ‘stablize’ the top and move the coffeemaker to an adjacent cold burner. I can actually hear air being sucked into the lower chamber after all of the liquid has been removed from the upper chamber, which takes less than 10-15 seconds once it starts. I then use an oven mitt to hold the handle, remove the top chamber and put it in its neat holder, and pour my eight cups of great tasting coffee into my twenty-five year old Stanley stainless steel thermos. I now have great tasting coffee – all day long. After the top and bottom units have cooled, I remove the filter and clean both chambers being careful to not bang them against anything hard. The glass is thin, which it has to be, but seems pretty durable. I give the unit five stars because I am the one who caused most, if not all, of the original problems by improperly storing the coffee beans which resulted in a lot of dust when they were ground. The taste of the coffee made by this unit warrants five stars. This is really the way to make the best cup of coffee on a machine that costs less than $1000 dollars. I’m not kidding. 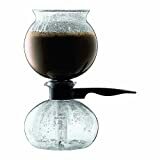 When this device works correctly, it give you the best tasting, clearest (no sediment) and prettiest cup of coffee you have ever tasted Even Using The CHEAPEST Beans or Grinds! 1. The spring loaded filtering device, although increadibly simple and easy to use and maintain did not work consistantly for me. Sometimes I would get a lot of sediment, sometimes crystal clear rich brown red coffee (perfect). Sometimes the top globe would drain completely (as it should) and sometimes only half way. I tried various grind coursness, filter adjustment, etc and never could get consistancy. 2. The handle needs to be longer and rounder. It is too short for the weight and feels awkward in the hand because of the way the bottom is cut out and shaped in general. 3. Glass broke on the bottom of the 2 pots. I left it on the stove and boiled out all of the water. 2 pots of coffee later a thin long crack developed leaking the coffee out on to my burner. Would like to see a little thicker glass. 4. Instruction book too skimpy especially for a coffee making technique that few have been exposed to. 5. The plastic stand for the upper glass globe should have a wider base to prohibit tipping. 1. The glass, although thin is pretty durable (in spite of it cracking on me after leaving it on the burner too long). It is really beautiful glass, even rings when you dry it with a microfibre cloth! Has a high clarity and shine. 2. It is easy to clean. Comes apart in seconds, rinse out, dry (works best with a microfibre cloth I found) and your done. I leave it out because I like the looks of it and people always ask what the heck it is! 3. It is easy and fast to use. Takes a few minutes to dump in the coffee and water (in separate glass globes/pots) and put together and start the coffee making process. It takes a few more minutes to have the coffee sucked into the lower pot and be ready to pour. Probably a 10 minute process total. 5. Makes the one of the best cup of coffee you’ve ever had even using the cheapest beans or grinds! In fact, I made better coffee at times using cheap grind over using custom roasted fresh expensive beans ground right before I put them in the pot. My suggestion, buy Kroger’s brand standard beans (right from the grocery store at about $2.50 a pound), grind them right before you’re ready to make your coffee and enjoy. Summary, Bodum needs to tweak this product a bit. I’m searching on-line for another brand of vacuum pot today to replace my broken $40.00 bodum so I can compare.